(P1) A man involved in a 50-million pound SCAM has lost a legal bid to have news stories about him removed from Google under the so-called “right to be forgotten”. (P2) Malcolm Edwards originally applied for an INJUNCTION forcing five media organisations including the BBC to remove their articles about him. (P3) He discontinued this claim, then applied for permission to serve PROCEEDINGS on Google instead. (P4) The judge at Nottingham County Court DISMISSED the application. (P5) In his judgment, His Honour Judge Nigel Godsmark said the applications were “totally without MERIT“. (P6) He granted three of the defendants – the Nottingham Post, Derby Telegraph and Associated Newspapers – costs of £6,627. (P7) The former law lecturer and LAY PREACHER must also pay the Guardian costs of £6,859 and the BBC £5,127. (P8) Mr Edwards claimed the continued publication of the stories interfered with his right to privacy and his ability to lead a normal life. (P9) He wanted to INVOKE the right to be forgotten under the Data Protection Act 1998, the European Union (EU) Data Protection Directive, and/or Article 8 of the Human Rights Act 1998, which protects the right to respect for private and family life. (P10) He also relied on the judgment of a top EU court in a case last year involving Google and a Spanish man. (P11) Since the Court of Justice of the European Union ruling, individuals have had the right to request that search engines remove certain web pages from their search results when people search for certain terms. (P12) Following the ruling, Google removed a large number of links from its search results and continues to do so. (P13) However, media organisations including the BBC started publishing links to news stories that have been removed from Google’s search results. (P14) In a witness statement for the Malcolm Edwards case, the BBC’s director of editorial policy and standards, David Jordan, said there was and remains “a very significant public interest” in the publication of the article complained about. (P15) He said the BBC News online service REPLICATES a library newspaper ARCHIVE and it is “important to ensure that it is retained INTACT to maintain public confidence in the service and avoid any suggestion that the BBC is ERASING THE PAST or ALTERING history or is otherwise failing to act independently and IMPARTIALLY“. 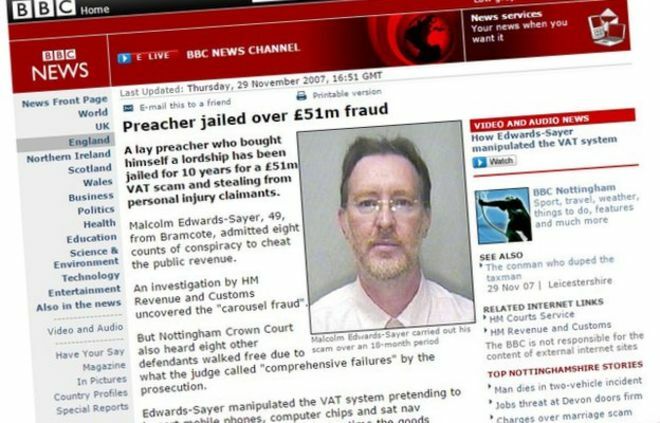 (P16) Mr Edwards, previously called Malcolm Edwards-Sayer, was jailed for six and a half years in November 2007 after admitting eight counts of CONSPIRACY to cheat the UK taxation system. (P17) He was sentenced to a further three and a half years in prison for other offences, and the judge decided the two sentences should run CONSECUTIVELY. (P18) This means Mr Edwards is still serving his sentence, although he is thought to have been released from prison on licence. (P19) The media organisations therefore argued that his offences could not be treated as historical, and it remained in the public interest for the articles to be published, particularly given the seriousness of the offences. (P20) They objected to the stories being removed from Google searches for the same reasons. (P21) News stories about the original case still show up when “Malcolm Edwards-Sayer” is typed into Google. (P22) Google, which was not a defendant in the case, told the BBC it does not comment on whether individuals have requested search results about them to be removed. (P23) However, when EVALUATING a request, Google considers whether or not there is public interest in the information remaining findable through its search engine. (P24) This means it is unlikely that Google would remove the search results about Malcolm Edwards-Sayer. The “right to be forgotten” is supposed to apply to ordinary people who are not PUBLIC FIGURES. Mr. Edwards is a convicted FELON. Should the “right to be forgotten” apply to him? Is there information about you on the Internet that you wish was not there? Are you careful about what you post on Facebook, Twitter, and other social media sites? Is it possible to completely erase the past?